After the P1, what car wouldn't seem boring? 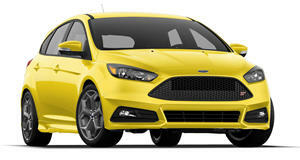 Hot hatches are finally coming to the US in a big way and Ford clearly has every intention to capitalize on this trend. And who could blame them? Just look at the seemingly never-ending success of the Volkswagen GTI. Now that we’re in the era of high output, small displacement turbocharged engines, we’re going to be seeing more and more automakers expand into this popular segment. But Ford is clearly dead serious about taking on the benchmark GTI with its Focus ST, which has even caught the interest of Jay Leno. Today he speaks with the ST’s chief engineer Jamal Hameedi who highlights its 252 horsepower and European driving dynamics. And the best part is that the Focus ST starts at just under $24,000.